Living in the moment is a good way to be happy, too. As is writing about (or reading) happiness - that's what I say, anyway. But you'll also find interesting 'happy thoughts' from a VideoJug video as well as Gale from HappyHalfway.com. Oh, if you'd like to share your thoughts what makes you happy then please do. Hmm, happiness is an inside job, it comes from within and can NEVER depend on circumstances or behaviours (like being grateful) or anything other than acceptance of "what is" this moment. And, a little more obscurely, what is the art of happiness? Interestingly, I now believe that knowing how to be happy has nothing to do with knowing what the answers to these questions are. To me, there are no happiness tests. Authentic happiness just is. You can see it in a happy person's smile. You can hear it in their voice. You can sense how their happiness touches every aspect of their life. Bad things happen to this person. Good things happen, too. And, throughout, they are happy. So, finding happiness? Well, happiness really is an attitude - so adopt the attitude. Recognise that you are not happy, in the first place. So don't settle, for example, simply because everyone else is settling! Choose to live your life with your own ingredients - ones that make sense to you! Then choose to be happy, instead. Simples. So am I happy, then? Well, I'm getting there. I'm getting to the place where I choose to be happy; a place where I believe I deserve happiness. Everyone wants to know how to be happy, right? So how come happiness is so elusive to so many people? It really all boils down to one thing. Yes, really, just one thing: You have to consciously decide to make being happy your number one priority. 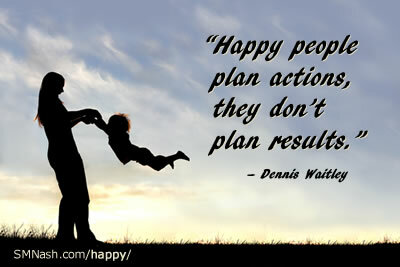 You have the opportunity to be happy in every moment - make the decision to be happy right now and watch what happens! Share this how to be happy page - thanks!